Bresha Meadows was released to return to her family on February 4, after surviving juvenile and mental health incarceration since her arrest in July 2016. Bresha was only 14 years old when she was charged with killing her father, who her mother and family said had inflicted years of abuse on them. Instead of receiving compassionate care, Bresha was criminalized for what many consider to have been self-defense. Prosecutors charged her with aggravated murder and sought to try her as an adult. She faced a potential life sentence in prison in Ohio. After instead pleading “true” to a charge of involuntary manslaughter, Bresha was sentenced to one year in a juvenile jail (with 10 months already served), six months of confinement in a mental health facility, and two years of probation once released. Bresha’s attempts to escape domestic violence and seek help were blocked by multiple systemsthat ultimately failed to support her, including the police and Child Protective Services. Bresha’s story reveals the powerful pipeline between girls’ experiences of domestic and sexual violence and their forced entry into carceral systems. Once arrested, black girls like Bresha face disproportionately high rates of prosecution and incarceration. Once incarcerated, Bresha joined the 84% of girls in the juvenile justice systemwho have experienced family violence prior to incarceration. We are both part of #FreeBresha, the small organizing collective that brought Bresha’s case to national and international attention. In August 2016, we formed a volunteer, ad-hoc defense committee to demand her freedom. A defense committee or campaign is a grassroots effort to secure the freedom of a person targeted for criminalization, through community organizing, political pressure, community education, legal and media advocacy, and other strategies. 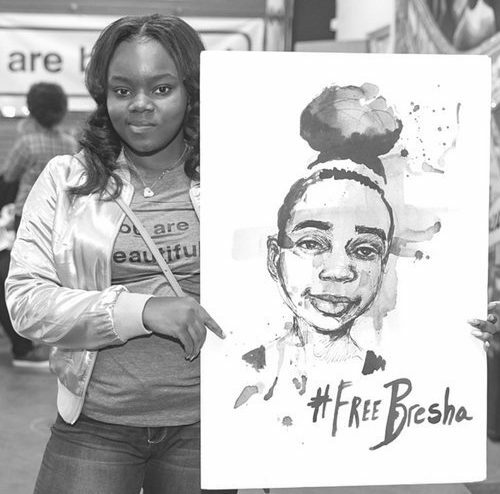 As part of an effort to #FreeBresha, we organized calls to action and then coordinated and publicized widespread decentralized actions into an organizing force to be reckoned with. Supporters across the world demanded care and resources, not cages, for Bresha and all survivors of domestic and sexual violence. We took a number of actions to #FreeBresha. We created a petition to drop the charges against her. We organized mass letter-writing to the prosecutor to release her immediately. We demanded media attention. We invited supporters to send postcards, letters, and books to Bresha. We promoted book drives and delivered thousands of books by women of color nationwide. We raised money for legal experts and emergency family support. We raised awareness about the abuse-to-prison pipeline for Black girls and women by producing a curriculum that was used at teach-ins and events across the country. We protested. We amped up support when Bresha was on suicide watch. We organized vigils. We solicited and circulated powerful artwork. We mobilized our allies in the antiviolence sector. We uplifted survival and freedom campaigns for other criminalized survivors. We wrote poetry and songs. We stormed Twitter. We organized court support for Bresha’s hearings. Collectively, we organized to #FreeBresha. And — against the force of mass criminalization and its targeting of Black children — we won. Bresha should never have been incarcerated, but it is a win nonetheless. The punishment system was unsuccessful in disappearing this young Black woman. As Bresha continued to endure punishment and isolation, we organized alongside her dedicated family and pro bono legal team, connected in our commitment to see her — and all survivors — supported and free. Our team worked hard and quickly, with no funding, office, or institutional support. We had the power of the people, though, and the momentum and tactics of a centuries-long tradition of freedom campaigns. We also had a broad national network of organizers ready to mobilize, especially youth organizers. Collectively, we demanded freedom and care for Bresha. We opposed her further traumatization and structural abandonment by criminalization. We refused to accept that, for defending her life, Bresha would be further victimized by state violence, compounding her existing trauma and adding her to the list of girls and women filling cages nationwide — to be counted among the fastest-growing segment of the incarcerated population. We connected Bresha’s placement on suicide watch to the traumatic effects of incarceration and isolation on youth and adults. 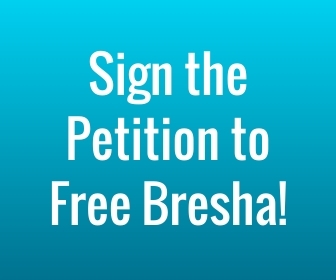 We tied our need to increase support for Bresha to organizing against the suicide crisis in California women’s prisons, demanding an end to the deadly practice of incarceration. We refused to exceptionalize survivor freedom as we organized in solidarity with movements to end the criminalization of survival of all kinds. We made Bresha’s case visible, to demand her freedom and to pressure prosecutors to stop pressing charges against survivors, if for no better reason than to avoid the organized threat of public exposure and shame. In Ohio, we heard from people who would know that prosecutors were nervous and concerned about the level of public attention and public pressure being brought to bear around Bresha’s case. The sheer number of media outlets from around the world calling to ask permission to film Bresha’s trial was a testament to the attention. We did this. Along the way, our defense committee received increasing requests for support for other criminalized survivor campaigns, so we worked with our Survived & Punished team to develop a toolkit to help resource people organizing grassroots freedom campaigns. We also continued to strategize mass defense campaigns for all criminalized survivors. Now, as Bresha returns home, we continue to urge criminal justice reform, abolition, and antiviolence movements to recognize that prisons of all forms are both filled with survivors and producers of state sexual violence. This is a crucial feminist issue, since survivors of domestic and sexual violence are disproportionately girls, women, and gender nonconforming people. Trans survivors are disproportionately criminalized and must be prioritized for resources and support. We call on the antiviolence movement in particular to make the changes necessary to include criminalized survivors at the center of survivor advocacy and service models. These changes need to happen at every point of criminalization — from prevention to arrest, pretrial, postconviction, and postrelease. Bresha’s case also reminds us why we all must work to develop and practice transformative solutions to violence that do not rely on carceral systems, including policing, prosecution, and prisons. Bresha still has two years of probation before her, so she is still under state surveillance. She is home but still not “free.” We will remain vigilant on her behalf. All who demanded Bresha’s freedom played a role in her survival and release and in pushing national discourse toward decriminalizing survival. Now, it continues to be on all of us to keep doing the work to end the criminalization of survival and to demand safe, resourced futures for Black girls like Bresha and for all survivors.